​​​​​​​​​​​​​​​​​​​SAN ANTONIO – According to U.S. Census Bureau data, San Antonio’s monthly housing rents are rising at a sharper rate than the state’s or the nation’s. Information is from the 2011–2015 American Community Survey Five-Year Estimates​​, the latest available. 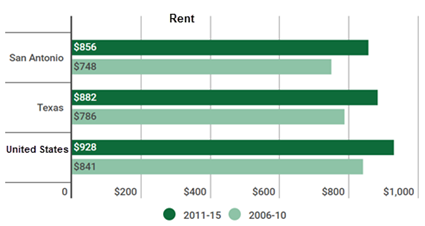 The city’s housing market is attracting a bigger share of renters than in years past. The median monthly rent for occupied housing inside San Antonio’s city limits rose from $748 in 2006–2010 to $856 in 2011–2015. In San Antonio, 91.3 percent of all housing is occupied, while Austin has an occupancy rate of 92.4 percent. 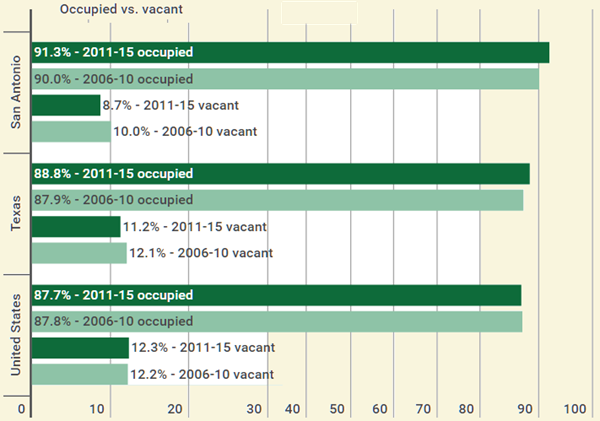 Houston’s and Dallas’ housing occupancy rates are in the upper 80s. ​Check out more San Antonio Housing Market Research.